It is fairly obvious how the blueberry received its name, but just for the record, it’s due to the blue coloring of the fruit. Blueberries were first appreciated by the Native Americans, who would dry them for much needed nutrition in the long, hard winter months. They were also used to heal various maladies such as morning sickness, headaches and coughs. The first time these precious little berries were commercially harvested was during the Civil War, when they were canned and sent to Union soldiers. Ask us about Vermont PYO Fruit or share comments. Feature your business, contact VTLiving. Dutton Berry Farmstands are well known for their Vermont grown produce and other unique local products. Dutton's offers pick your own strawberries and raspberries and who can not resist taking a taste while berry picking. Come join us for strawberry and raspberry season at Dutton Berry Farm! The domestication of the blueberry was accomplished by Dr. Coville, who was a USDA researcher experimenting on wild blueberries in an attempt to cultivate them. 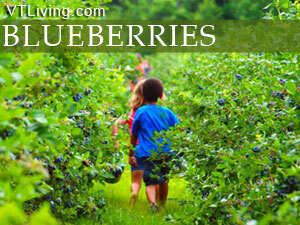 The first blueberry plants that he chose to experiment on were from Greenfield, New Hampshire. 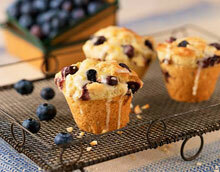 Wild blueberries are smaller than their cultivated counterparts, and have a more intense, tangy-sweet flavor. The wild crops have the advantage of a broad range of variations which provide their distinctive flavor. Wild blueberries are often referred to as lowbush blueberries, while the cultivated berries are referred to as highbush blueberries. Cultivated blueberries are mostly hybrids, thus allowing more successful growth in other parts of both the United States and the rest of the world. The first highbush blueberries to be planted in Vermont were done so in 1948. That first blueberry farmer initially planted only a couple of rows because he was unsure how they would do in the Vermont soil. By 1950, as many as four different varieties were being grown in the Green Mountain state, and in 1963, the second commercial planting of highbush blueberries was successfully accomplished. It was in Putney, Vermont where cultivated blueberries got their start, and Putney is still known today as Vermont’s blueberry capital. While blueberries are grown everywhere in the state, different varietals are grown in different areas. Which ones are grown where depends entirely upon the weather. The soil is also an important factor in a blueberry bush’s health, because blueberries need highly acidic soil to survive. Some varities require more acidic conditions than others, and the blueberry farmer makes the final decision on what type to grow in his region. 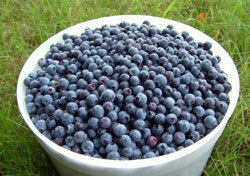 Blueberry harvesting season starts in early or mid-July, and runs through mid-September each year. Exactly when the berries will be ripe depends upon several factors, including weather conditions, rainfall and seasonal temperature averages. Before heading out to your nearest blueberry farm, be sure to call the farm and verify that the blueberries are indeed ripe and ready to pick.